Wang Jingwei (Wang Ching-wei; 4 May 1883 – 10 November 1944; born as Wang Zhaoming (Wang Chao-ming), but widely known by his pen name "Jingwei" ("Ching-wei")), was a Chinese politician. He was initially a member of the left wing of the Kuomintang (KMT), but later became increasingly anti-Communist after his efforts to collaborate with the CCP ended in political failure. His political orientation veered sharply to the right later in his career, after he joined the Japanese. Wang was a close associate of Sun Yat-sen for the last twenty years of Sun's life. After Sun's death Wang engaged in a political struggle with Chiang Kai-shek for control over the Kuomintang, but lost. Wang remained inside the Kuomintang, but continued to have disagreements with Chiang until Japan invaded China in 1937, after which he accepted an invitation from the Japanese Empire to form a Japanese-supported collaborationist government in Nanjing. Wang served as the head of state for this Japanese puppet government until he died, shortly before the end of World War II. His collaboration with the Japanese has often been considered treason against China. His name in both mainland China and Taiwan is now a term used to refer to traitors, similar to "Benedict Arnold" for Americans, "Quisling" for Norwegians and Silvério dos Reis for Brazilians. Born in Sanshui, Guangdong, but of Zhejiang origin, Wang went to Japan as an international student sponsored by the Qing Dynasty government in 1903, and joined the Tongmenghui in 1905. As a young man, Wang came to blame the Qing dynasty for holding China back, and making it too weak to fight off exploitation by Western imperialist powers. 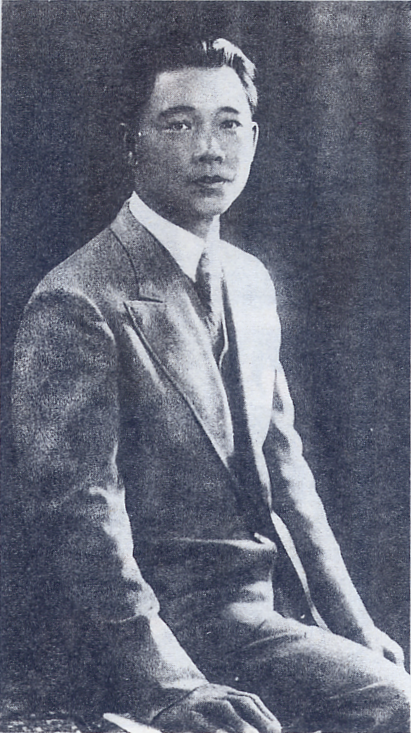 While in Japan, Wang became a close confidant of Sun Yat-sen, and would later go on to become one of the most important members of the early Kuomintang. In the years leading up to the 1911 Revolution, Wang was active in opposing the Qing government. Wang gained prominence during this period as an excellent public speaker and a staunch advocate of Chinese nationalism. He was jailed for plotting an assassination of the regent, Prince Chun, and readily admitted his guilt at trial. He remained in jail from 1910 until the Wuchang Uprising the next year, and became something of a national hero upon his release. During and after the Xinhai Revolution, Wang's political life was defined by his opposition to Western imperialism. In the early 1920s, he held several posts in Sun Yat-sen's Revolutionary Government in Guangzhou, and was the only member of Sun's inner circle to accompany him on trips outside of Kuomintang (KMT)-held territory in the months immediately preceding Sun's death. He is believed by many to have drafted Sun's will during the short period before Sun's death, in the winter of 1925. He was considered one of the main contenders to replace Sun as leader of the KMT, but eventually lost control of the party and army to Chiang Kai-shek. Wang had clearly lost control of the KMT by 1926, when, following the Zhongshan Warship Incident, Chiang successfully sent Wang and his family to vacation in Europe. It was important for Chiang to have Wang away from Guangdong while Chiang was in the process of expelling communists from the KMT because Wang was then the leader of the left wing of the KMT, notably sympathetic to communists and communism, and may have opposed Chiang if he had remained in China. Wang Jingwei in his twenties. During the Northern Expedition, Wang was the leading figure in the left-leaning faction of the KMT that called for continued cooperation with the Chinese Communist Party. Although Wang collaborated closely with Chinese communists in Wuhan, he was philosophically opposed to communism and regarded the KMT's Comintern advisors with suspicion. He did not believe that Communists could be true patriots or true Chinese nationalists. In early 1927, shortly before Chiang captured Shanghai and moved the capital to Nanjing, Wang's faction declared the capital of the Republic to be Wuhan. While attempting to direct the government from Wuhan, Wang was notable for his close collaboration with leading communist figures, including Mao Zedong, Chen Duxiu, and Borodin, and for his faction's provocative land reform policies. Wang later blamed the failure of his Wuhan government on its excessive adoption of communist agendas. Wang's regime was opposed by Chiang Kai-shek, who was in the midst of a bloody purge of communists in Shanghai and was calling for a push farther north. The separation between the governments of Wang and Chiang are known as the "Ninghan Separation" (Script error). Chiang Kai-shek occupied Shanghai in April 1927, and began a bloody suppression of suspected communists known as the "White Terror". Within several weeks of Chiang's suppression of communists in Shanghai, Wang's leftist government was attacked by a KMT-aligned warlord and disintegrated, leaving Chiang as the sole legitimate leader of the Republic. KMT troops occupying territories formerly controlled by Wang conducted massacres of suspected Communists in those areas: around Changsha alone, over ten thousand people were killed in a single twenty day period. Fearing retribution as a communist sympathiser, Wang publicly claimed allegiance to Chiang and fled to Europe. Between 1929 and 1930, Wang collaborated with Feng Yuxiang and Yan Xishan to form a central government in opposition to the one headed by Chiang. Wang took part in a conference hosted by Yan to draft a new constitution, and was to serve as the Prime Minister under Yan, who would be President. Wang's attempts to aid Yan's government ended when Chiang defeated the alliance in the Central Plains War. In 1931, Wang joined another anti-Chiang government in Guangzhou. After Chiang defeated this regime, Wang reconciled with Chiang's Nanjing government and held prominent posts for most of the decade. Wang was appointed premier just as the Battle of Shanghai (1932) began. He had frequent disputes with Chiang and would resign in protest several times only to have his resignation rescinded. As a result of these power struggles within the KMT, Wang was forced to spend much of his time in exile. He traveled to Germany, and maintained some contact with Adolf Hitler. The effectiveness of the KMT was constantly hindered by leadership and personal struggles, such as that between Wang and Chiang. In December 1935, Wang permanently left the premiership after being seriously wounded during an assassination attempt a month earlier. During the 1936 Xian Incident, in which Chiang was taken prisoner by his own general, Zhang Xueliang, Wang favored sending a "punitive expedition" to attack Zhang. He was apparently ready to march on Zhang, but Chiang's wife, Soong Meiling, and brother, T.V. Soong, feared that such an action would lead to Chiang's death and his replacement by Wang, so they successfully opposed this action. Wang accompanied the government on its retreat to Chongqing during the Second Sino-Japanese War (1937–1945). During this time, he organized some right-wing groups under European fascist lines inside the KMT. Wang was originally part of the pro-war group; but, after the Japanese were successful in occupying large areas of coastal China, Wang became known for his pessimistic view on China's chances in the war against Japan. He often voiced defeatist opinions in KMT staff meetings, and continued to express his view that Western imperialism was the greater danger to China, much to the chagrin of his associates. Wang believed that China needed to reach a negotiated settlement with Japan so that Asia could resist Western Powers. 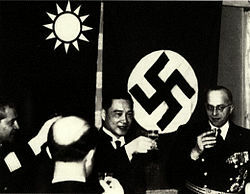 Wang receiving German diplomats while head of state in 1941. In late 1938, Wang left Chongqing for Hanoi, French Indochina, where he stayed for three months and announced his support for a negotiated settlement with the Japanese. During this time, he was wounded in an assassination attempt by KMT agents. Wang then flew to Shanghai, where he entered negotiations with Japanese authorities. The Japanese invasion had given him the opportunity he had long sought to establish a new government outside of Chiang Kai-shek's control. On 30 March 1940, Wang became the head of state of what came to be known as the Wang Jingwei regime based in Nanjing, serving as the President of the Executive Yuan and Chairman of the National Government (行政院長兼國民政府主席). In November 1940, Wang's government signed the "Sino-Japanese Treaty" with the Japanese, a document that has been compared with Japan's Twenty-one Demands for its broad political, military, and economic concessions. In June 1941, Wang gave a public radio address from Tokyo in which he praised Japan, affirmed China's submission to it, criticised the Kuomintang government, and pledged to work with the Empire of Japan to resist communism and Western imperialism. Wang continued to orchestrate politics within his regime in concert with Chiang's international relationship with foreign powers, seizing the French Concession and the International Settlement of Shanghai in 1943, after Western nations agreed by consensus to abolish extraterritoriality. The Government of National Salvation of the collaborationist "Republic of China", which Wang headed, was established on the Three Principles of Pan-Asianism, anti-communism, and opposition to Chiang Kai-shek. Wang continued to maintain his contacts with German Nazis and Italian fascists he had established while in exile. In March 1944, Wang left for Japan to undergo medical treatment for the wound left by an assassination attempt in 1939. He died in Nagoya on 10 November 1944, less than a year before Japan's surrender to the Allies, thus avoiding a trial for treason. Many of his senior followers who lived to see the end of the war were executed. Wang was buried in Nanjing near the Sun Yat-sen Mausoleum, in an elaborately constructed tomb. Soon after Japan's defeat, the Kuomintang government under Chiang Kai-shek moved its capital back to Nanjing, destroyed Wang's tomb, and burned the body. Today the site is commemorated with a small pavilion that notes Wang as a traitor. Chinese under the regime had greater access to coveted wartime luxuries, and the Japanese enjoyed things like matches, rice, tea, coffee, cigars, foods, and alcoholic drinks, all of which were scarce in Japan proper, but consumer goods became more scarce after Japan entered World War II. In Japanese-occupied Chinese territories the prices of basic necessities rose substantially as Japan's war effort expanded. In Shanghai of 1941, they increased elevenfold. Daily life was often difficult in the Nanjing Nationalist Government-controlled Republic of China, and grew increasingly so as the war turned against Japan (c. 1943). Local residents resorted to the black market in order to obtain needed items or to influence the ruling establishment. The Japanese Kempeitai, Tokkō, collaborationist Chinese police, and Chinese citizens in the service of the Japanese all worked to censor information, monitor any opposition, and torture enemies and dissenters. A "native" secret agency, the Tewu, was created with the aid of Japanese Army "advisors". The Japanese also established prisoner-of-war detention centres, concentration camps, and kamikaze training centres to indoctrinate pilots. Since Wang's government held authority only over territories under Japanese military occupation, there was a limited amount that officials loyal to Wang could do to ease the suffering of Chinese under Japanese occupation. Wang himself became a focal point of anti-Japanese resistance. He was demonised and branded as an "arch-traitor" in both KMT and Communist rhetoric. Wang and his government were deeply unpopular with the Chinese populace, who regarded them as traitors to both the Chinese state and Han Chinese identity. Wang’s rule was constantly undermined by resistance and sabotage. The strategy of the local education system was to create a workforce suited for employment in factories and mines, and for manual labour. The Japanese also attempted to introduce their culture and dress to the Chinese. Complaints and agitation called for more meaningful Chinese educational development. Shinto temples and similar cultural centres were built in order to instill Japanese culture and values. These activities came to a halt at the end of the war. For his role in the Pacific War, Wang has been considered a traitor by most post-World War II Chinese historians in both Taiwan and mainland China. His name has become a byword for "traitor" or "treason" in mainland China and Taiwan. The mainland's communist government despised Wang not only for his collaboration with the Japanese, but also for his anti-communism, while the KMT downplayed his anti-communism and emphasised his collaboration and betrayal of Chiang Kai-shek. The communists also used his ties with the KMT to demonstrate what they saw as the duplicitous, treasonous nature of the KMT. 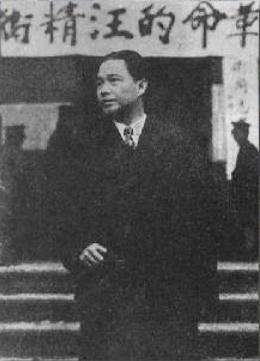 Both sides downplayed his earlier association with Sun Yat-sen because of his eventual collaboration. Wang was married to Chen Bijun and had six children with her, five of whom survived into adulthood. Of those who survived into adulthood, Wang's eldest son, Wenjin, was born in France in 1913. Wang's eldest daughter, Wenxing, was born in France in 1915, and is now living in New York. Wang's second daughter, Wang Wenbin, was born in 1920. Wang's third daughter, Wenxun, was born in Guangzhou in 1922, and died in 2002 in Hong Kong. Wang's second son, Wenti, was born in 1928, and was sentenced in 1946 to imprisonment for being a hanjian. ↑ Spence, Jonathan D. (1999) The Search for Modern China, W.W. Norton and Company. pp. 338–339. ISBN 0-393-97351-4. ↑ Barnouin, Barbara and Yu Changgen. Zhou Enlai: A Political Life. Hong Kong: Chinese University of Hong Kong, 2006. p.38. Retrieved 12 March 2011. ↑ Gillin, Donald G. "Portrait of a Warlord: Yen Hsi-shan in Shansi Province, 1911–1930" The Journal of Asian Studies. Vol. 19, No. 3, May, 1960. p. 293. Retrieved 23 February 2011. ↑ "CHINA: President Resigns". TIME Magazine. 29 September 1930. http://www.time.com/time/magazine/article/0,9171,740400,00.html. Retrieved 24 February 2011. ↑ Barnouin, Barbara and Yu Changgen. Zhou Enlai: A Political Life. Hong Kong: Chinese University of Hong Kong, 2006. p.66. Retrieved 12 March 2011. ↑ 6.0 6.1 6.2 Cheng, Pei-Kai, Michael Lestz, and Jonathan D. Spence (Eds.) The Search for Modern China: A Documentary Collection, W.W. Norton and Company. (1999) pp. 330–331. ISBN 0-393-97372-7. ↑ Wang Jingwei. "Radio Address by Mr. Wang Jingwei, President of the Chinese Executive Yuan Broadcast on 24 June 1941" The Search for Modern China: A Documentary Collection. Cheng, Pei-Kai, Michael Lestz, and Jonathan D. Spence (Eds.). W.W. Norton and Company. (1999) pp. 330–331. ISBN 0-393-97372-7. ↑ Spence, Jonathan D. (1999) The Search for Modern China, W.W. Norton and Company. p. 449. ISBN 0-393-97351-4. ↑ "Wang Ching-wei". Encyclopædia Britannica. http://www.britannica.com/EBchecked/topic/635349/Wang-Ching-wei. ↑ Frederic Wakeman, Jr. “Hanjian (Traitor) Collaboration and Retribution in Wartime Shanghai.” In Wen-hsin Yeh, ed. Becoming Chinese: Passages to Modernity and Beyond. (Berkeley: University of California Press, 2000), 322. ↑ Wang Ke-Wan, “Irreversible Verdict? Historical Assessments of Wang Jingwei in the People’s Republic and Taiwan.” Twentieth Century China. Vol. 28, No. 1. (November 2003), 59. Gerald Bunker, The Peace Conspiracy; Wang Ching-wei and the China war, 1937–1941 Harvard University Press, 1972. James C. Hsiung and Steven I. Levine, eds. China's Bitter Victory: The War with Japan, 1937–1945 M. E. Sharpe, 1992. Ch'i Hsi-sheng, Nationalist China at War: Military Defeats and Political Collapse, 1937–1945 University of Michigan Press, 1982. Wen-Hsin Yeh, "Wartime Shanghai",Taylor & Francis e-Library, 2005. Wikimedia Commons has media related to Wāng Jīngwèi.